Finally. 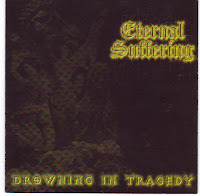 I've been meaning to do a death metal post for such a long time and this is the first of several so for you death metal freaks, watch out, shits gonna start getting BrOOtal ;) So it begins with one of the underground's most obscure but beloved gems 'Drowning In Tragedy,' by the long deceased Eternal Suffering. The band began in 1994 and took their first major step with the release of the demo 'Remain Forever In Misery,' which was a primitive but viral slab of brutality. However, the progression for the material for the full length was astounding as the band managed to juxtapose deftly the brutality factor (as well as escalate it) with stunning atmosphere. Check the doomy riffs that open and then run throughout 'Let The Dark Waters Flow,' it adds so much more personality to the material and makes it much more memorable. Where Eternal Suffering excelled though was their breakdowns, absolute towering monoliths that crushed everything. After the album's release in 1999 the band played numerous fests and then began work on their next batch of songs for a split with the almighty Vomit Remnants in 2000. Well for varying reasons, that split never happened (a tragedy, it would have been one of the best ever) and in 2001, the band disbanded. Now whilst 'Drowning in tragedy,' has been long out of print and is very hard to find there is good news. Firstly pathos productions (www.myspace.com/pathosproductions666) will be reissuing (but god knows when) the band's entire discography, in the meantime, if you really need to find a copy of the album, then hit http://www.ebay.com/. The good news doesn't end there, the 6 tracks that were set to be featured on the split with Vomit Remnants will be reissued with some bonus material this year on the awesome Inherited Suffering (http://www.myspace.com/inheritedsufferingrecords) you can preview a track on there.